The weekend days are beginning to cool off a little bit but the water is still pretty nice. I am happy to report that visibility has recovered after the typhoon, and the reefs were scrubbed clean by the large waves brought by our last visitor. This week we travel back north on Highway 58 to a dive spot that I have always enjoyed taking my family and friends to. Diamond Beach and Turtle Bay is really a great place for anyone who wants to walk on the beach, snorkel across the reef, or dive among acres after acres of coral. Site Location: On Highway #58 go north of Kadena Circle continuing past the Ramada Renaissance Resort and continue on Highway #58 toward Nago. After passing through Onna Village drive past the community harbor. Just past Seragaki Island and around a curve in the road you will see a turnout on your left for a brand new, and very nice, resting area. You should park near the exit. The entrance to the beach has a new set of really nice wooden steps that will take you down to the dive site. 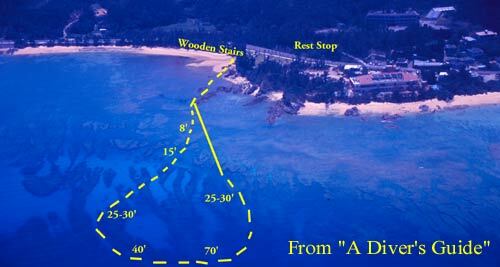 Recommended 1st Dive Profile: Walk down the wooden steps from the parking area to the beach. Keeping the wall on your left follow the shoreline out to the entry point, which is beyond two rocky fingers on your left. At low tide this can be a long walk for young divers and those not accustomed to carrying equipment some distances. At high tide the water will buoy you up and assist in carrying your load. When you cross between the two rocky fingers shoot a course across the bay toward the large white hotel. Follow that heading, either walking or on snorkel (depending on tide), until you have 15-20' of water beneath you. You may find an abandoned discharge pipe that will serve as a guide pointing to the best place to begin your dive. When you have reached a point that has 15'-20' beneath you, or the end of the pipe, descend. You will be on a sandy bottom between two coral fingers that parallel one another. Begin your dive by following the course these two fingers give you into the open water. While exploring these fingers and observing life among coral colonies you will descend to 70' where you will find yourself at the base of the fingers and a sloping alluvial fan that gradually descends to 120'. Here you will be amazed at the amount of life among the rocky rubble. A reciprocal heading that is due east will take you back into the coral fingers guiding back to the jump off point near the abandoned pipeline. On bright sunny days near noon the sun reaches down and illuminates the coral and the white sand bottom providing photographers with a wonderful opportunity for wide-angle shots. Colonies of sea anemone too numerous to catalog exist here with every type of clown fish imaginable. It is great dive site for everyone, the novice and the expert. While the entry can be arduous the rewards are worth it. Maybe that is why it has always been called "Diamond beach!" Sure hope that you will get out this weekend with your friends or your entire family and enjoy this great place in the sun. For more dive sites like this be sure to drop by your favorite dive shop, or an AAFES bookmark, and pick up a copy of my new book "A Diver's Guide" where you will find about 50 more dive sites for your enjoyment here on Okinawa. See you at the Beach! 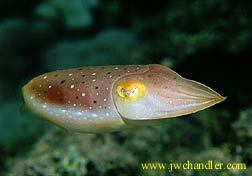 Fish Pic of the week is the cuttlefish. While there are five kinds of cuttlefish, we often only see three types on Okinawa. Here you see the Broadclub Cuttelfish (sepia latimanus) as it hovers near the reef at Diamond Beach. Often confused by snorkelers as a squid, the cuttlefish can be easily identified by its thicker body that has the shape of an American Football. 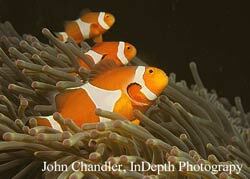 They change color to fit their surroundings and temperament. The really big challenge when diving is to approach them slow enough so that they will become as interested in you as you are in them. Try to make eye contact with them and you will see that the lights are on and someone is certainly at home. Have fun, the more you learn about our reefs the more you will enjoy them.